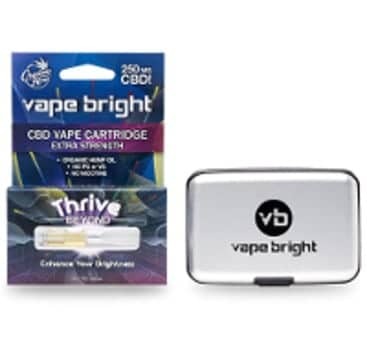 We invite you to go Beyond with Vape Bright’s extra potent formulation, designed to push the limits of how much CBD can fit in a single cartridge. Each Beyond cartridge contains over 250 mg of great-tasting pure CBD oil with no PG/VG. Designed with you in mind, the Beyond cartridge is the easiest way to get the most CBD into your body. Each serving of Beyond gives you 10 mg of CBD with much less effort, offering more than 15 times the amount of CBD in each cartridge than our competitors. The best in portable CBD vaporization, this 510 thread battery charges quickly and will keep up with you. Would you rather buy direct from Vape Bright? IMPORTANT: Due to the high CBD Potency of our cartridges, we advise that you keep them at stable room temperature. Highly fluctuating temperatures may cause some crystallization. If crystallization does occur it can be easily remedied by running the cartridge under hot water or heating it up with a blow dryer. We advise all of our customers to be aware that the crystallization is not a defect, but a natural occurrence due to the nucleation effect that occurs in CBD at high concentrations. Please be careful after heating the cartridge as the mouthpiece is metallic and will become very hot.